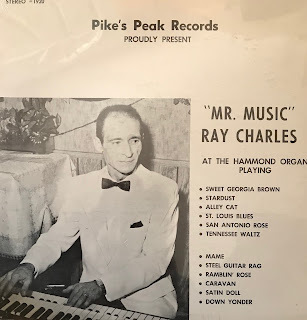 You wouldn't believe the number of esoteric Colorado records I have unearthed - like this fantastic instrumental LP, from Colorado Springs keyboardist, Ray Charles, otherwise known as "Mr. Music." Can't find a thing on this musician. Zilch, zero, nada. As always, dear reader, if you can't assist, please drop me a line. Apparently there was, believe it or not, another "Mr. Music," in Colorado Springs, the clarinetist Ed Nuccio. Professional clarinetist Ed Nuccio was famous for nurturing children, teens and adults in their pursuit of music, so much so that he earned the moniker "Mr. Music. "The longtime band director, educator and founder of New Horizons Band of Colorado Springs died April 12 from cancer. He was 80 years old. Nuccio arrived in Colorado Springs in 1958 to play with the Air Force Academy Band where he earned an Airman of the Year award in 1959. He performed with Arthur Fiedler, longtime conductor of the Boston Pops Orchestra, and in bands for Bing Crosby, Bob Hope, Dean Martin and others who played in concert at The Broadmoor. 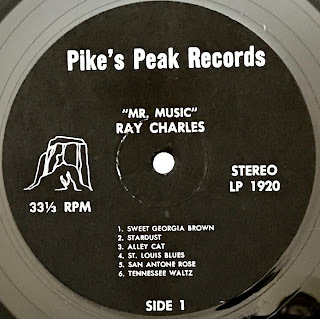 Released, in 1971, on the Pike's Peak (apostrophe noted) label, this disc isn't on the same Pikes Peak label, of which Pueblo polka duo Frankie and Connie Bregar appear. Again, any help would be great. Damn fine instrumental album, with lots of spacey keyboards - really diggin' that cover of "Caravan" (audio below). 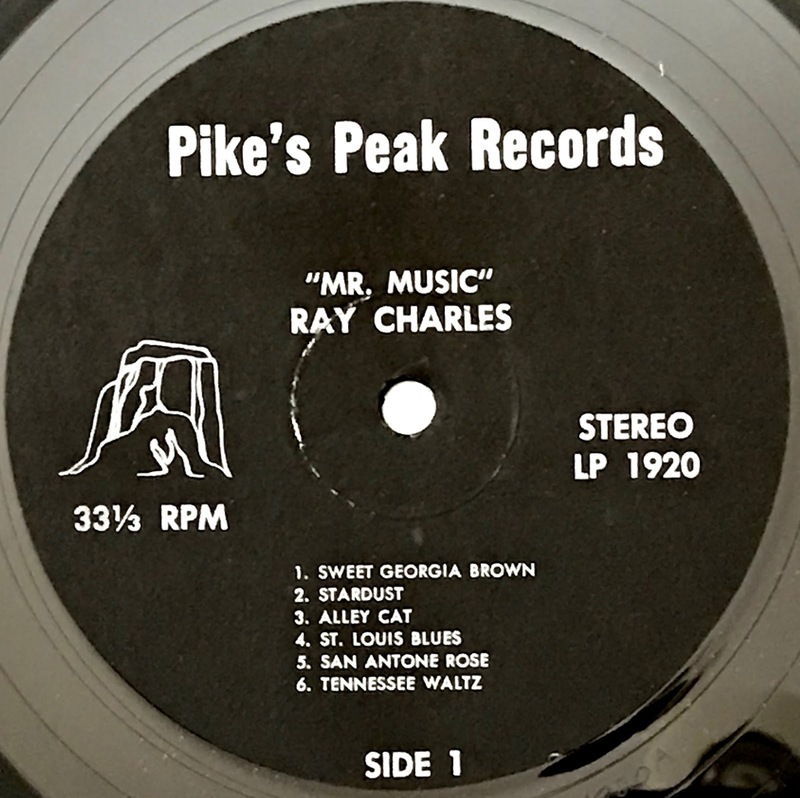 From the majestic snowcapped rockies has emerged a fresh sound - the sound of Mr. Music, Ray Charles, who has appeared in person and thrilled audiences at most of the smart, plush nightclubs from coast to coast! The Hammond organ, always a lush, pleasing sound, seems to take on a new depth and dimension under the talented fingers of Mr. Music.